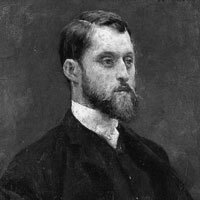 Julius Stewart was a figure and genre painter from Philadelphia who spent almost his entire life in Paris. From the 1880s through the first decade of the 20th century, he ranked with John Singer Sargent as one of the most popular expatriate American painters in Paris. He was following a genre begun by his friend, Jean Beraud, but Stewart's more vivacious work was considered especially American. He painted the life he thoroughly enjoyed - Parisian high society. Stewart's works are spirited and realistic, full of fashionable women, sumptuous fabrics and elegant drawing rooms. In addition to portraits of his well-to-do friends, Stewart fullfilled commissions for portraits of society figures and celebrities, among them the actress Sarah Bernhardt. Stewart's first success was being chosen to exhibit at the Paris Salon in 1883. His reputation was firmly established with, The Hunt Ball (1885, Essex Club, Newark) and The Hunt Supper (1889, Buffalo Club, New York) was shown at the Paris Exposition. His high society women portraits show a particular fascination with their evolving roles in a changing society, from the depiction of beauty for beauty's sake to the portrayal of the educated sophisticate. In An Enthralling Novel he succeeds in conveying the reader's concentrated attention to the book, thus portraying her as a well-read woman and not just another pretty face. Currently there are no available Julius LeBlanc Stewart paintings for sale at the Mark Murray Gallery. Please contact us if you are interested in selling your Julius LeBlanc Stewart paintings or other artwork from the 19th century and early 20th century.